How to hit the beach in style? 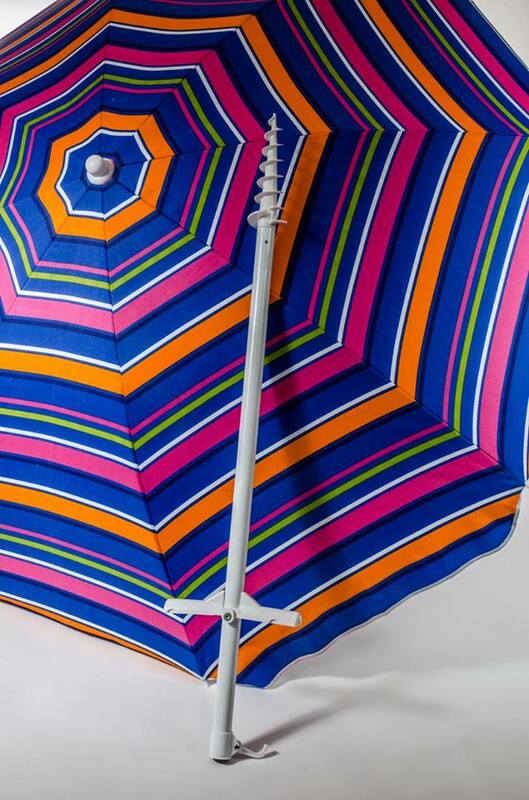 Try this eye-catching beach umbrella - Susan Said... WHAT?! When my children were very young, we were a rag-tag bunch at the beach. Our towels showcased an assortment of kid-friendly, animated characters. Our chairs were purchased at various times and were mismatched in both height and color. And, worst of all, our beach umbrella was a holdover from my own childhood – an incredibly heavy, wooden, steel and oilcloth contraption from the late 1970s. We certainly were a sorry-looking bunch! Now that my kids are grown and it’s just my husband and myself relaxing ocean-side, we look a lot more like those chic, tranquil couples I always envied a little as I chased a wayward tot headed pell-mell toward the water, or frantically tried to stop a toddler from eating sand. Our chairs now match. 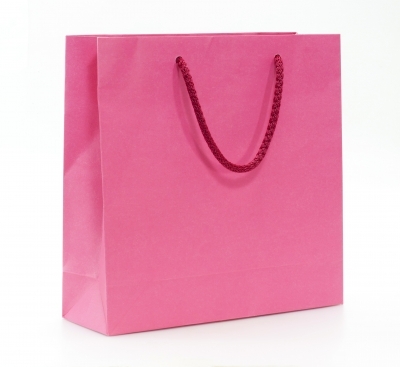 Our towels are thick, luxurious and no longer feature Barney, Barbie or Pokemon. 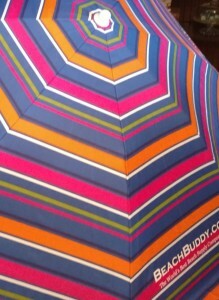 And, best of all, we have a gorgeous new beach umbrella from BeachBuddy.co! Our new umbrella opens to 6 ½ feet, so there is always plenty of shade. And, the material is a thick Polyester with silver lining. Rated UPF 50, the rays can’t filter through, even in the brightest sunshine. This umbrella even has a tilt feature, so we can angle the umbrella as the sun changes position. And, this is one beach umbrella that will stay put. It has an easy to use twist anchor system (unlike our ancient one, which was literally just a pointy wood pole). Although this is a very sturdy umbrella, it’s also incredibly lightweight (under 6 lbs.!). And, it comes with a matching carrying case with shoulder strap (like our folding chairs) so that even I can haul from the house or car down to the water’s edge. 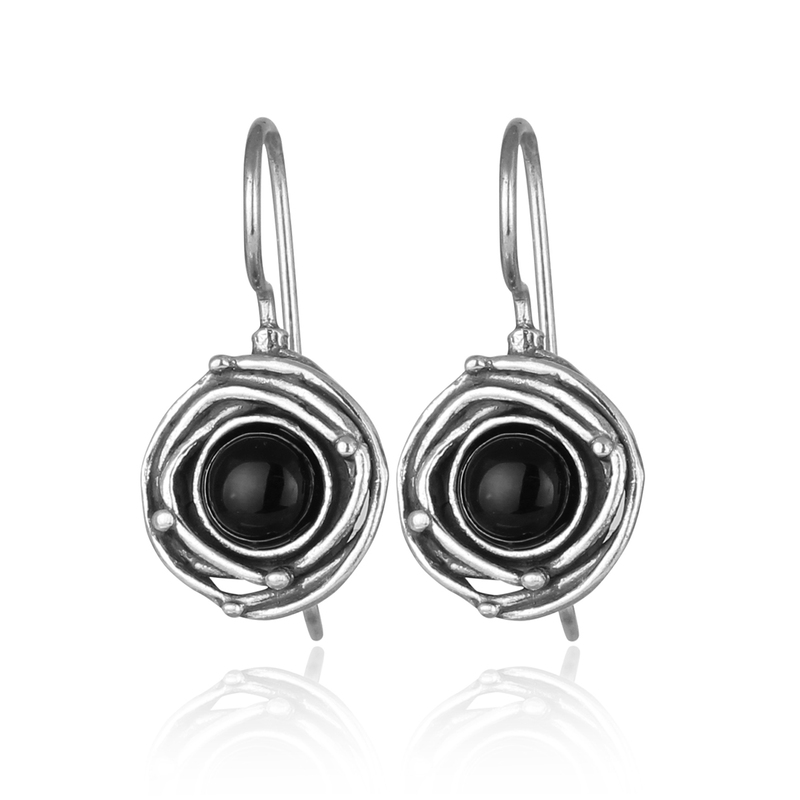 But for me, the best part is how incredibly cute it is! I absolutely love the bright colors (easy to spot after a long walk on the beach). And, the stripes are so festive – they remind me of those traditional striped beach cabanas from the early 1900s. Although it is not shown in the top photo, there is promotional branding on this umbrella (see my picture). Branding certainly doesn’t bother me (I carry a Coach bag, so I can’t complain). But, to make sure that I had received the correct umbrella, I did ask the company and was told that the new umbrellas do feature the branding. So if you order, please know that BeachBuddy.co appears in four spots around the edge. Now, someone please pass me the sunscreen. I am oh-so-ready to hit the beach! PHOTOS: Used with permission by BeachBuddy.co. DISCLAIMER: No financial compensation was received in exchange for this post. I did, however, receive a promotional sample of the beach umbrella mentioned above in order to fully evaluate the product. Regardless, I only recommend products or services I believe will be good for my readers.